color of the dog's coat. Blue dogs will have a charcoal color. Liver dogs will have brown that will vary from very pale to a deep dark chocolate. Solid having no other color mixed into it. As with the black, no other color will exist in this dog. dog has brown pigmentation on the nose, paws and eye rims. Liver nose- dog is liver colored. Nose determines it's color. To very light almost a Cream. of blue. It's beautiful color and rare. Shades of Blue= Eggplant to Blue. Brindle - This is a combination actually, of a base coat of fur with streaking. dark keeping some of it's black hairs. Most keep a black face. Red - A very deep and dark orange.Must have a Black Nose, Red is a solid color even thou there is a black face. Most Reds will have a dark mask.Dark to Light Black Tips are common on most Reds and other colors. Black face is not on A.K.C papers; so black mask is used. Individuals like their black face because it hides the eye stains. *Recently more breeders are breeding for more darker faces. Silver - White but with a deep shine. Born blue silver coloring. True Blue means the nose is bluish. Nose is a Light blue or gray. If had black face can have a black nose. Extremely rare at birth. There are many different shades of Silver. Usually have a black face and hair will grow into a beautiful Silver gray. There may be some liver highlights creating the color. There has been some confusion among breeders, buyers and other regarding the chocolate colored Shih Tzu. The most recognized and largest dog club, the American Kennel Club, does not list chocolate as a standard or alternate color of the Shih Tzu. 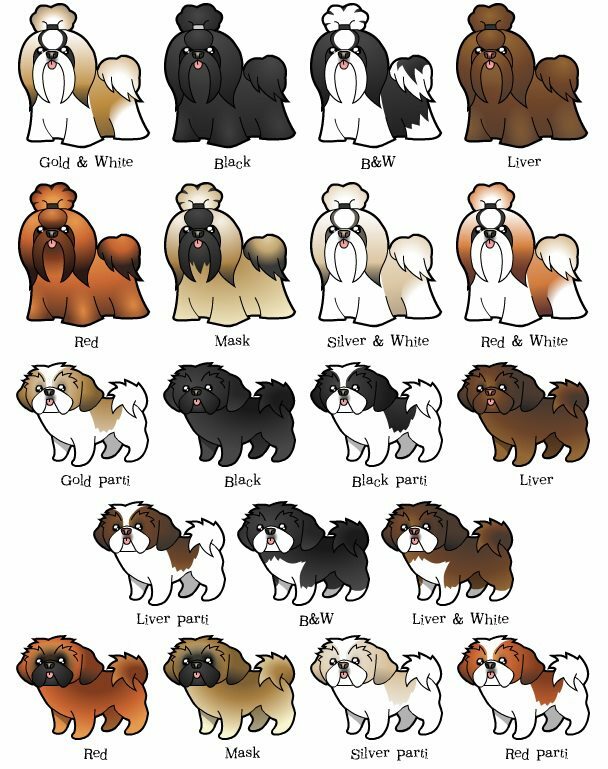 A dog may be referred to as this color for reason of having a brownish coat, however this dog will official be listed as liver colored both on registration papers and when shown at dog clubs. coloring. I recommend getting a puppy you will enjoy no mater what the color. weight at eight weeks old by 3.6 - 4.2 to estimate her healthy adult weight. Multiply a male shih tzu puppy's weight at eight weeks old by 4.2 - 4.8 to estimate his healthy adult weight.